Following the unsatisfying court session held on the 22nd day of March 2018, in an Abuja Federal High Court presided by judge Binta Nyako; it is no longer a hidden truth that justice has been evicted and at such raped by her supposed defender under the cruel watch of a hungry and depraved judge who has shamelessly perverted via trade. The session commenced with some sorts of comedies and ended up with a secret trial; in this same order, the Nigerian government could prove is that the act of importing a transmitter is treasonous. The point is that these defendants have been held for almost four years in prisons just because a transmitter was imported; meanwhile, these imported transmitters did not vanish into the country but have to pass the normal process with the immigration. Another amusing aspect is that treasonable felony (an act of overthrowing a sitting government) was committed via radio transmitters. Invariably, we were made to understand that all the radio stations in Nigeria are convicts of treason because as much as I know, radio transmitters are not produced in Nigeria. So, therefore, all management of radio stations operating in Nigeria have in one way or the other imported transmitters; this crime as we were made to know is treasonous. But unfortunately, only a few among others are persecuted while others become vulnerable. I watched and listened with amusement as the whole drama keeps unfolding. It was laughable seeing the so-called investigators disorganized and left in shambles by the defense councils of IPOB. Indeed, the judicious classes in Nigeria have been degenerated morally, and are recently in the putrid state. Justice has been tainted and vitiated. Martin Luther King, Jr. quotes “Injustice anywhere is a threat to justice everywhere”. At the same time, Mother Jones wrote, “injustice boils in men’s hearts, as does steel in its cauldron, ready to pour forth, white hot, in the fullness of time”. The Infernal and fiendish kangaroo way of supposed Justice Binta Nyako handling the alleged treasonous case of Citizens Nnamdi Kanu, Benjamin Madubugwu, David Nwawuisi, Bright Chimezie and Chidiebere Onwudiwe is greatly injudicious; it is tantamount into a deceptive act which convicts Binta as a murderer of justice in this 21st century. 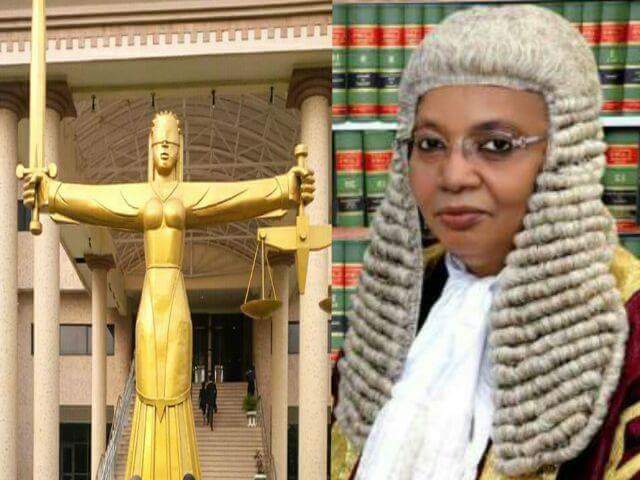 Justice Binta Nyako has always made her intentions known to the world that she must allow the case of Biafrans under her jurisdiction suffer huge backwardness, and she indicates this by her every court sitting unnecessary stories couple with a whole lot of adjournment even when it is obvious that there is nothing worth it. The biased judge has no pace in giving justice, she has instead painted the well-known wrong to be believable truths; however, no matter how evil beautiful is, it will only elapse within a short time. It is laughable to see how naive the so-called secret witnesses could be. This very process has been debated for over three years and all they could come up with lastly is the most diabolic phase of it all. The greatest rate of such Imprudent attitude is highly disgustful; meanwhile, the prosecutors were supposed to be cautioned, but the biased judge isn’t seeing or maybe she decided to flap the necessary things on purpose. Just like Plato in his statements quotes, “He who commits injustice is ever made more wretched than he who suffers it”. Binta Nyako is wretched. She is aware that injustice is censured since the censures are afraid of suffering, and not from any fear which she has of doing injustice. It is uncultured for Binta to be so blinded by prejudice, this is the only reason why she will sit and watch people make a mockery of what she swore to defend. Only at the juncture will I advise Binta Nyako to stop learning how to use her left hands. I believe she would have known the best way to defend this course of justice. The problem is the use of some words that seem to be strangers to them. Ignorantly, they are unfamiliar with treason that’s why they couldn’t differentiate the treasonable act of Muhammadu Buhari in the year 1985 from the step to Self Determination taken by Nnamdi Kanu’s IPOB. It’s now left for Binta to go home and reevaluate her dubious judgments and her less attention to the persecution of innocent people.